A multi-use park that is open to mountain bikers, equestrians, and hikers, so please observe proper trail etiquette while enjoying the trails. The first several miles of trail along the Big River are tight, twisty, and heavily wooded. Keep your eyes open, as it is in this area is where you are most likely to see, especially in the fall, the abundant wild turkey and deer. After crossing the road, you begin heading up and down the numerous ridges and ravines running through the park. The trails are combination of open-field crossings and wooded singletrack, consisting mainly of dirt, with a bit of rock mixed in. Depending on your location, it is possible to see numerous rock outcroppings, small ponds and historical relics, such as flint chippings from Indians, farm homesteads, and a family cemetery. More trails are being developed on a continuing basis, so follow the carsonite signage marking the trail. Trailhead parking is at the first parking lot past the bridge. The entrance to the trail is in the field to the left of the restrooms, marked with white carsonite signage. 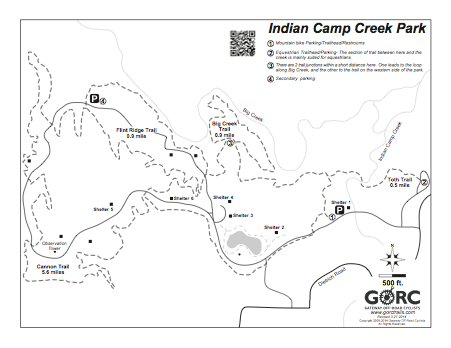 A large Park map showing the trails is located at the kiosk near the equestrian parking lot (first gravel road to the right). From Interstate 70, go north on Highway 40/61 for approximately seven miles to Dietrich Road (first left after passing W). Turn west on Dietrich Road for ¾ mile to the park entrance (on right). Composting toilets, water fountains (at the main red-roofed pavilion), playgrounds, primitive camping (site still being developed), pavilions w/grills. 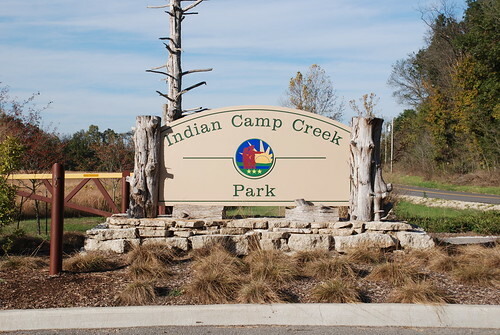 Situated at the confluence of Big Creek and Indian Camp Creek in northwestern St. Charles County, Indian Camp Creek Park is the largest in the St. Charles County Parks Department’s system. At more than 600 acres, Indian Camp Creek Park furthers the department’s goal of preserving green space by featuring dedicated prairie land, vast wooded hills, limited infrastructure, and protected habitat for the deer, turkey, quail, and other wildlife. It also presents a look at the history of the region. Evidence shows that several American Indian communities settled the site in the Mississippian Period (A.D. 1000 to 1400). The Parks Department also plans to incorporate the homestead and family cemetery that dates to the early 1800s in the historical review. Among the unique features are the nature-themed playground at the center of the park and several miles of multi-use, natural trail (presenting the county’s first parkland open to equestrian day-use). Future development will add group camping facilities with a central amphitheater designed to host jamborees, a restored silo tower that overlooks the park and the surrounding countryside, an interpretive site to honor the region’s history, and the Toth Nature Preserve. In addition to these distinctive features, the park also offers picnic shelters, a six-acre fishing pond, and other improvements designed to enhance the natural surrounding. Trail was in great shape. 3-4 ruts with water in low spots on the Cannon Trail. Other than that is was perfect. A few wet spots can be hopped if you have the skill, if not please dismount and walk those areas. There are already some deep tread cuts in the small amount of mud on the trail. Needs tires. Few sloppy spots left. Few rough spots to smooth out. Enjoy!